Are your thrill-seeking kids always looking for the next wild waterslide? How about trying a waterslide that's really a water jump? 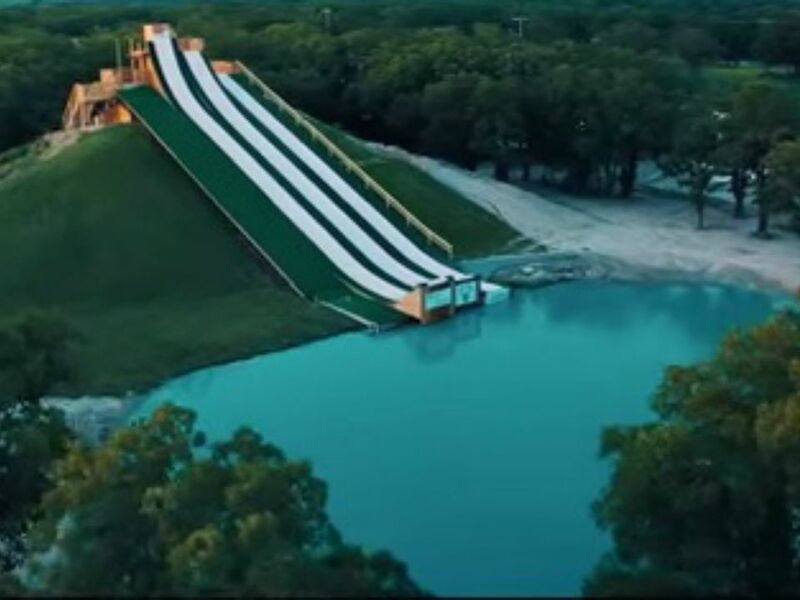 Open since the spring of 2015, the Royal Flush is a triple water slide and jump in Waco, Texas, that has become a YouTube sensation with 44 million views and counting. The video from Round III Media opens tamely enough, with pretty girls in bikinis—carrying an adorable puppy, no less—but these are mere distractions. The real star of the video is the Royal Flush slide itself, which sends kids zooming downhill and then—whoosh!—soaring up through the air and then splashing down into a 16-foot-deep swimming hole. Not only is it the coolest way to beat the Texas heat, but it's guaranteed to have kids across America begging their parents to take them to Waco. You'll find the Royal Flush at BSR Cable Park, where other activities include cable wakeboarding and floating down a lazy river. A day pass for the Royal Flush water slide costs just $15. Kids must be at least 6 years old and wear a life vest. The Royal Flush, cable park and lazy river are open during the spring through fall months. The facilities are closed during the winter. Waco is located about halfway between Dallas and Austin. The drive from either city to Waco takes about 90 minutes. With a population of about 130,000, Waco is a medium-size city that is very pretty, as it is set on the Brazos River and has a lot of green spaces. It is the home of Baylor University and the birthplace of the Dr. Pepper soft drink. Be sure to set aside significant time to explore Waco's Riverwalk, a seven-mile, sculpture-lined walkway that runs along both sides the Brazos River, connecting the Baylor campus with Cameron Park. The path winds under the city's historic suspension bridge (circa 1870), and offers plenty of opportunity for the kids to run around or to have a family picnic with goods from the on-site farmer's market. At its north end of the Riverwalk is the sprawling 400-acre Cameron Park, with many natural features to enjoy, including its limestone cliffs, woodlands, and natural springs, as well as playgrounds and a disc golf course. The park is also home to the Cameron Park Zoo, a natural-habitat venue offering a herpetarium, African savannah, Brazos River Country exhibit, aquarium, and Asian forest exhibit featuring endangered orangutans and Komodo Dragons. At the south end of the Riverwalk, you'll find the Texas Ranger Hall of Fame and Museum, the Texas Sports Hall of Fame, and the kid-friendly Mayborn Museum Complex at Baylor University, which features a natural history museum with walk-in dioramas (including one on the Waco Mammoth Site) and exploration stations that focus on the geology paleontology, and archeology of Central Texas. Don't miss the 16 themed discovery rooms, which encourage hands-on learning with interactive displays. No self-respecting trip to Waco is complete without a visit to the Dr. Pepper Museum. America's oldest major soft drink was created in Waco in 1885, and the historic bottling plant-turned-museum is chock full of Dr. Pepper memorabilia, vintage commercials, interactive workshops for kids, and a classic soda fountain where you can taste the bubbly soda. Waco Mammoth National Monument is one of the most significant Ice Age fossil beds in the world. To date, 23 Columbian mammoths, a camel, and the tooth from a saber tooth tiger have been found. Part of the Texas Paddling Trail network, the Brazos River runs right through Waco and is a beautiful and calm river for a leisurely paddle. You can rent a kayak, canoe or paddleboard from Outdoor Waco. From lakes, swimming holes and natural springs, Texas offers many ways to splash into summer. Hamilton Pool: This is one of the most amazing swimming holes near Austin. Located less than a mile upstream from the Pedernales River, Hamilton Pool is a scenic nature preserve with limestone outcropping that creates a natural 50-foot waterfall that that plunges from a semicircular cliff into a sinkhole. The swimming hole is a Texas summer favorite and serves as a cool place to swim on a warm Texas day. But make sure you get your reservations ahead of time; they are required from May 1 through September 30. White Rock Lake: This lake in Dallas covers 1,254 acres and is one of the most heavily used parks in the Dallas Park system. Local outfitters rent kayaks and stand up paddle boards. Comal River: In New Braunfels, near Austin, tubing on the Comal River is a great option since the river is only three miles long and is heavily shaded. There are plenty of outfitters around the Comal River that can help you rent tubes and drive you back to your car. Balmorhea State Park: This state park is located in Toyahvale, about four miles from Balmorhea in West Texas. The state park is the largest spring-fed swimming pool in the world, and is known for its crystal-clear water.